When Harley-Davidson launched the Sportster line in 1957, it was the baddest bike on the block. Nothing on this side of the pond went as fast or handled as well, which helped to solidify Harley-Davidson as the bike to have if you were serious about riding. Even the legendary XR750s, which dominated flat track racing for decades (and were Evel Knievel’s bike of choice) were based on the Sportster, so the bike has probably racked up more race wins than any other model. Over the years, public perception of the Sportster has dropped off, and I once overheard a biker-wannabe tell his young son, “You don’t want that. It’s a girl’s bike.” So much for a legendary reputation. 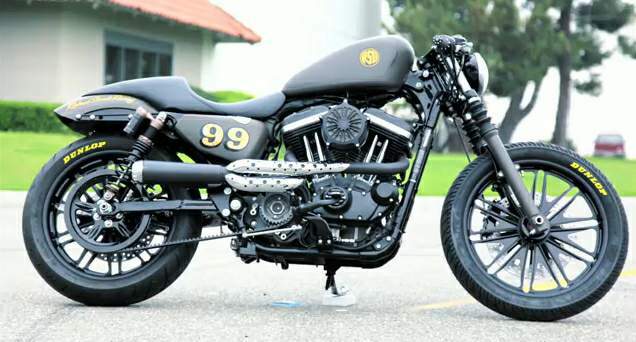 Roland Sands Design gets it, and has built a Sportster that is truly worthy of the name. Dubbed the Café Sportster, the bike is RSD’s interpretation of exactly what a Café racer should and shouldn’t be, and it’s a rolling catalog of their custom parts. They’ve pioneered an new two-tone black finish (called, “Black Ops”) that has mil-spec strength; in other words, if it doesn’t wear off the barrel of an assault rifle, chances are it won’t wear off your air cleaner or fuel cap. It’s a stunning finish, and if I rode a Harley (and had disposable income) I’d be all over the RSD Black Ops catalog. I’m seriously loving the air cleaner and wheels, and check out the detail work on the bike’s triple clamp. Even their clip ons are equal parts art and function, and that’s what bikes should be about.